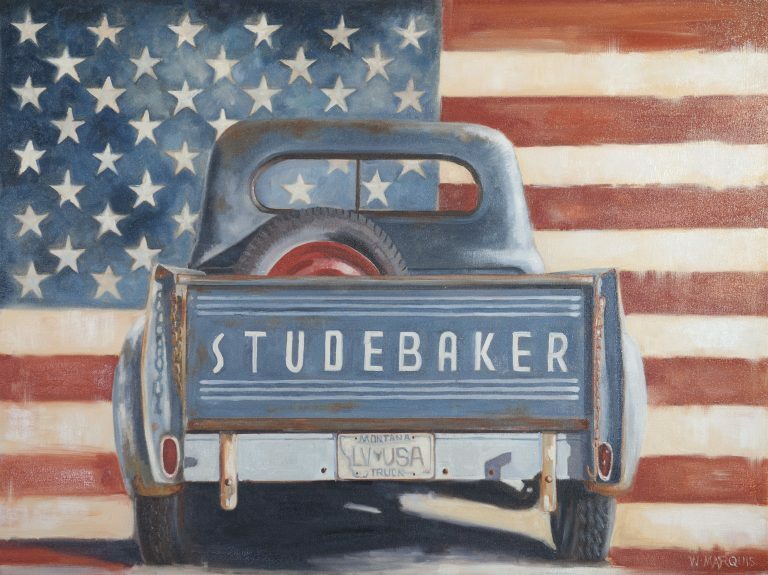 As patriotic as a Fourth-of-July party, the American flag flies for this vintage Studebaker. The original, Stars and Stripes, oil painting has been chosen for auction at The Russel Exhibition and Sale, March 17-19, 2016 in Great Falls, Montana. This prestigious art event is held each spring to benefit the C.M. Russell Museum, named in honor of, Charles Russell, one of Montana and America's greatest western artists. The Russell also show cases the best of modern western artists through exhibitions, events, and sales of their art. Last year The Russell raised over $5,000,000. For yourself or as a gift, Stars and Stripes, is available as a signed print on archival fine art paper, ready to mat and frame. Two sizes: 5 X 7, and 8 X 10. Free USPS Priority shipping.